Equity funds are an excellent investment option for individual investors. It allows the investor to invest in the share market by using the expertise of qualified and professional fund managers. Equity fund or stock funds invest primarily in stocks or equities. It is a type of mutual fund that deals with shares of public limited companies. The price of an equity fund or the Net Asset Value is arrived at by calculating the net asset value of the fund minus the liabilities of the fund. Equity funds are an excellent investment option for individual investors. It allows the investor to invest in share market by using the expertise of the qualified and professional fund managers who primarily deal in equity investments. Equity funds are of many types, and they are classified by size, investing style, market capitalization, and geographical location. People with professional expertise manage equity funds, and another significant advantage of this resource is that they are available for every type of investor. 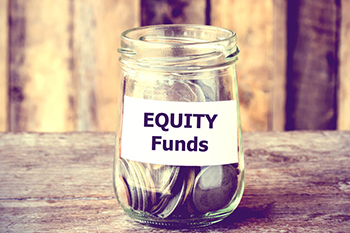 If the investor has a lump sum amount or some extra cash acquired form sale proceeds or retirement, it can be used to invest in equity funds. This method is the most favored while investing in mutual funds as they allow the investor to build a corpus in discipline and hassle-free manner. The main advantage of SIP is that it can be started even with a small amount and inculcates investing discipline. Diversification: The equity funds consist of different stocks in the portfolio. An individual investor may not have sufficient funds to have a diversified portfolio on their own. Through equity funds, portfolio diversification is more affordable and less risky when investing through equity funds than directly investing in the different type of stocks. Investment convenience: With equity funds, you can even invest as low as Rs500 by starting a Systematic Investment Planning(SIP) and it can be done by investing small amounts at regular intervals. These small amounts that the investor devotes inculcate a discipline of saving. This habit is beneficial when there is a plan for long-term investment and the wealth management. Tax saving feature: When investing in equity funds, the investor also gets the benefit of tax saving investments. The investor can claim a tax rebate up to Rs1.5 lakhs under section 80C by investing in equity funds. This deduction is available when investing in Equity Linked Savings Scheme (ELSS) and the lock-in period for this fund is three years. If your investment period is more than a year, there is no need to pay taxes on capital gains. The dividend received through investments in equity funds are also tax-free. Liquidity: When investing in stocks, there is little or no liquidity option. However, investing in equity funds gives the investor more liquidity. They can redeem their investments when there is higher Net Asset Value (NAV) available than the price spent or invest more in equity mutual funds when the market is lower. Such freedom helps the investor to have better control over their investments. Professional management: When you invest in equity funds, you get an opportunity to use the services of experienced portfolio managers, who track the mutual fund's performance and invest the savings in the top performing stocks ensuring profitable returns. Conclusion: Equity funds are the best investment option for an investor who is looking to invest in share market even if they have little knowledge about the market.